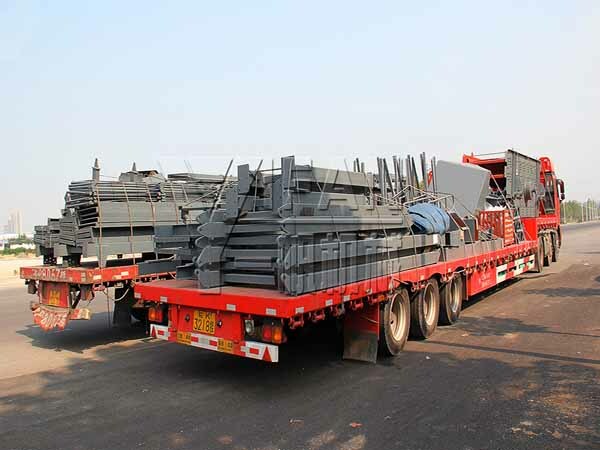 This morning Yifan Machinery Co., Ltd. Shanghai customer product delivery, the goods mainly 3YK1545 models of circular vibrating screen and structural frame. Circular vibrating screen with circular motion, is a multi-count, efficient new shaker. Circular vibrating screen adopts the barrel type eccentric shaft vibration exciter and partial block help to adjust amplitude, screening specifications, with a reliable structure, strong exciting force, high screening efficiency, low vibrating noise, durable, easy maintenance, use of safety features , shaker structure: mainly by screen box, exciter, suspension (or support) device and the motor and other components. Motor through V-belt drive the exciter shaft rotates, centrifugal force due to the unbalanced weight of the shaker, so that was vibrating screen box. Changing the exciter eccentric weight, get different amplitudes. We have a unity of design team and advanced technical support, Yifan Machinery is committed to creating the most advanced crushing and screening equipment Institute, shaker as one of our products, get the praise in the world, our customers get the praise .